We are successfully ranked amongst the top manufacturer, exporter, importer and supplier of the broad range of Hydraulic Presses. Our offered hydraulic presses are appreciated by our patrons for its optimum finish & high performance. These hydraulic presses are checked in terms of quality in order to supply a flawless range. 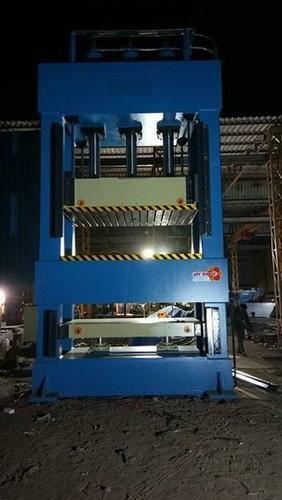 Moreover, we are giving these hydraulic presses to our customers on diverse specifications as per their requirements in a promised given time period. The finest range of Industrial Equipment is manufactured, supplied, exporter, importer and service provider by us at Monotech Engineers Private Limited, ever since our establishment in the year 1991. Manufacturing of this range is commenced as per the set industry norms and guidelines, utilizing the finest raw materials and modern machines, in compliance with the set industry norms and guidelines. This ensures the product’s performance and longer service life. The offered range comprises the finest and the most demanded products like Press Brake Machines, EOT Cranes and JIB Cranes, having a high preference in the market. In addition o this, the offered range is known to be marked at the most reasonable rate possible. The highly advanced state-of-the-art infrastructural facility at Monotech Engineers Private Limited, has been parted into several units, highly operational in nature. This helps us in managing the firm’s operations, in the most smoothest and effective possible manner. To attain several of the firm’s predefined goals and targets, the facility has been equipped with all the necessary machinery and equipment. Further, the facility regularly upgraded, helps us in generating a huge client base comprising M/S Bharat Electronics, M/S Bharat Heavy Electrical Limited and M/S Chittranjan Locomotive Works and in extending our reach in the market.